Meadowlark serves up coffee, while its guests serve up music. Lincoln, Neb.—Looking for something to do next Wednesday night? At Meadowlark Coffee and Espresso in Lincoln, Neb., you can enjoy delicious coffee or tea with friends while local musicians play the caffeinated audience some songs. Or, you can strut your own stuff and be one of those that take to the microphone. 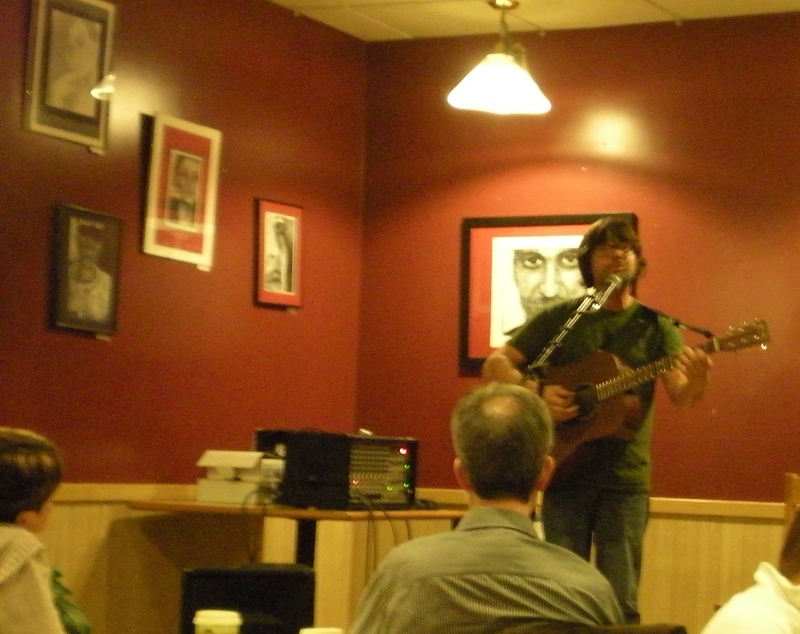 It’s open mic night every Wednesday at Meadowlark, and from 8 p.m. to midnight, any kind of creativity is welcome. For instance, there’s a man known simply as “bear hug guy” (name origin, as of yet, unknown) who comes nearly every week and plays some song covers on the piano. Hannah Wiebe, a twenty-year-old barista at Meadowlark said that he is the most memorable act because, not only does he play covers, he parodies songs so that they somehow become a discussion about healthcare. “Bear hug guy” was there on Wednesday, January 23, and played a healthcare rendition of a Beatles song. There were also quite a few folk players and groups, sporting acoustic guitars, mandolins, and banjos. It was difficult to not tap my feet and nod my head to the catchy bluegrass melodies, and as musicians they were quite talented. For example, The Original Prime Suspects played a great show, covering several songs, such as “Hobo’s Lullaby.” The Prime Suspects, a duo from Lincoln, involve Steve Kehler, 56, and Donn Samuelson, 63. Both have been playing the blues and folk since they were in their teens, and have been playing tunes together for a couple of years. They also played “Sittin’ on Top of the World,” a song from the 1930s blues band Mississippi Sheiks. In addition to playing a few songs together, they each played one or two on their own. Kehler, who reminds me a lot of my good friend Joe Villaca, played “San Francisco Bay Blues” by Jesse Fuller. Kehler said he plays because he likes “the applause, the compliments, the love of it.” He and Samuelson are each grateful to have a place to play, and that the people who let them play are awesome. “Live to play, play to live,” Samuelson said about what keeps him playing the music he’s loved since 1963. The Original Prime Suspects frequent several locations in Lincoln, Neb. They’ll be at Bagels & Joe’s at 48th St. and Old Cheney tonight, January 24. Another coffee shop you might find them at is Mo Java Café & Roasting Co. They usually do two shows a week, and I suggest making some time to give them a listen. Before starting, one of the three jokingly stated that “this song’s about a train with nobody on it.” The name of their group or of their members is unknown, as they did not introduce themselves. Just to let you know, open mic night at the Meadowlark is not only for folk/blues musicians. The first act, performed by a young man that introduced himself as “Notorious Ace” played a few Cee Lo Green songs, approaching the audience with a blend of acoustic guitar and hip-hop. Between songs, he would give his own personal interjections, even to the annoyance of some audience members. I found it commendable, albeit a bit drawn on. “I like seeing people express themselves in a way other people would not feel comfortable doing. Just the way they put themselves out there is admirable,” said Alexandria Bluvas, 22, a first-time visitor at the Meadowlark open mic night. Wiebe, a barista that has been working at the Meadowlark for two and a half years, said that poets and their works are also welcome, though it is rare for one to show up. The coffee shop used to have a night devoted to slam poetry, but the host had to discontinue it due to worsening epileptic conditions. Don’t be discouraged from doing some readings though, if you’re so inclined. Meadowlark gives Lincoln an outlet for all types of vocal creativity. So next time you’re looking for something to do on Wednesday night, be sure to visit Meadowlark Coffee & Espresso at 1624 South St. in Lincoln, Neb. For more information, call the event host at (402) 477-2007.